World-renowned football manager Jose Mourinho has shown off his Russian language skills as he heads a cast of stars from an array of areas for RT’s new World Cup promo video. 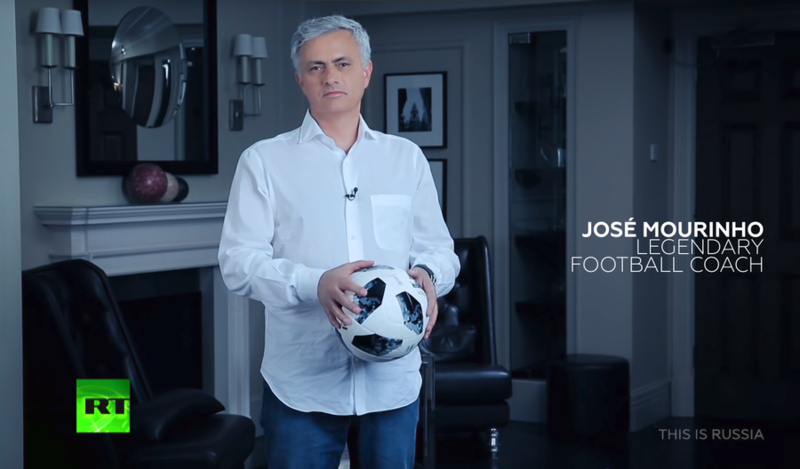 Mourinho joins figures from some of Russia’s most famous fields for the clip, starting with the elegant ballerinas of the Mikhailovksy Theater, who take to the stage to gracefully prance and pirouette, all while passing the World Cup ball around. They are followed by ice hockey forward Vladimir Bryukvin of Dynamo Moscow, who skates across the ice with the ball before firing off a shot. That cues up Russian rhythmic gymnast Ekaterina Selezneva, who manipulates the ball skillfully on the mat before the match ball takes to the water. 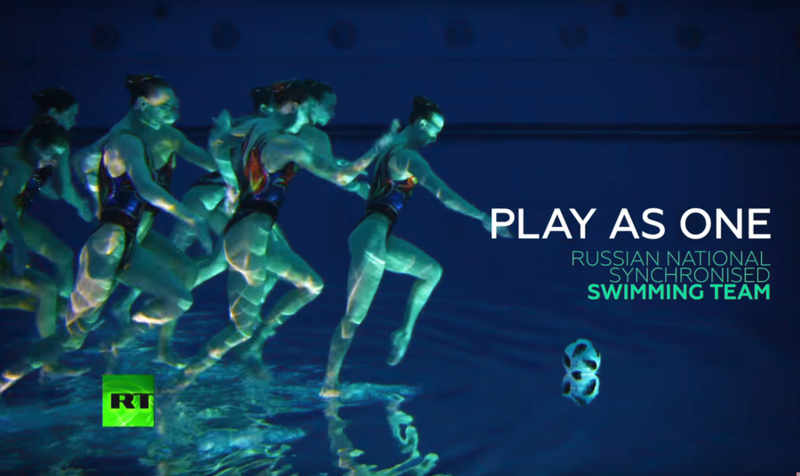 There, members of the Russian national synchronized swimming team move in unison to push the ball through the pool with a ripple - accompanied by the caption 'Play as one'. Russian cosmonauts were recently filmed having a cosmic kickabout with a World Cup match ball at the International Space Station, and one of their colleagues, Oleg Kononenko, is next to add to RT’s eclectic line-up as he volleys a floating football toward the screen. 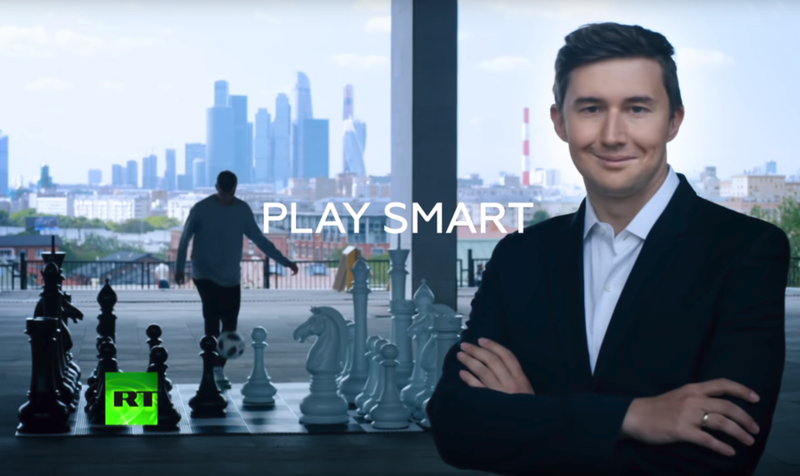 Russia’s chess grandmasters are as renowned as their cosmonaut compatriots, and current chess star Sergey Karjakin is the next to follow, playing out a giant-sized game with freestyle footballer Igor Oleynik – with the skyscrapers of Moscow’s financial district providing an equally super-sized backdrop. After Oleynik has shown off his dazzling control – as Karjakin approvingly looks on – the ball ends up in the hands of coaching great Jose Mourinho, who will be at the forefront of RT’s World Cup coverage this summer. RT will be bringing you full World Cup coverage across all its various channels and websites, and has launched a dedicated World Cup website with all the latest news and information on the tournament – check it out here: www.rt.com/fifa2018.